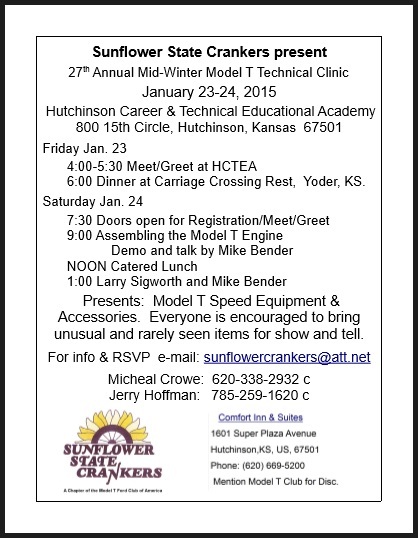 Have not seen any mention of the technical seminar in Hutchison, KS. Are there plans for this year? It's usually held in mid January. Yes, fourth Saturday in January this time. That's the 24th. Mike Bender is going to present engine assembly. I hear there will be several cars on display. New this year we have an e-mail address, sunflowercranker@att.net, please RSVP if you will be eating with us. Not as important but please RSVP if your coming any way. I will be sending out a newsletter right after Christmas.